Simple graces, prayers and blessings from around the world. Rich treasury of graces, poems, prayers and blessings drawn from around the world. Selections hve been specially chosen to address the spiritual needs of children and to encourage giving, service and gratitude. 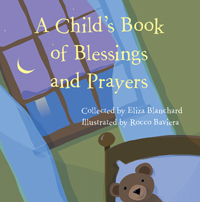 Includes words to bless the morning, share at bedtime, honor a birthday, even give thanks for a friend next-door. Each selection is surrounded by engaging and child-friendly, full-color illustrations. This diverse collection, with prayers from Hindu, Sioux, Islamic, Jewish, Christian and Unitarian Universalist traditions, to name only a few, highlights the common threads that can unite people of all faiths. Beautifully illustrated in full color. Ages 4 and up. And please help me to be a friend. To each and every one I meet.